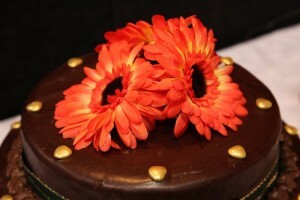 Chocolate cakes - Weddings Guide. Everyone loves chocolate! Instead of the traditional white wedding cake, how about a rich, yummy chocolate cake instead. You don’t have to hide a flavored cake under plain white icing, not only can you have a chocolate cake, but go ahead and frost it with chocolate icing, too. These are some fantastic ideas for delicious and gorgeous chocolate wedding cakes. The great thing about a chocolate wedding cake (besides the taste, of course) is that it can work for any style of wedding depending on how you design it. Whether your style is glitz and glamor with lots of beading on your dress, country and homey, or modern and chic, there is a chocolate wedding cake design which will be perfect for you. A chocolate wedding cake can be the perfect centerpiece for a grand wedding reception. Imagine an ornate ballroom in a luxury hotel. Begin by designing a cake which is very tall; five or more tiers would be good – you want your wedding cake to make a statement. Place it upon a silver cake stand and decorate it with fresh red roses between each tier. Top the cake with a small silver vase filled with red roses. Then decorate the sides of each tiers with a hand applied scroll pattern in crystals. 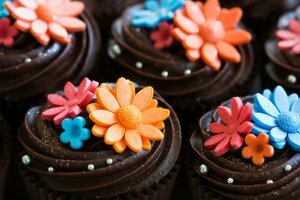 The sparkling detail will really pop against the dark chocolate frosting. Chocolate wedding cakes can also be romantic. Lighten up the appearance of dark brown frosting with pink and light green accents. The effect will be softer if the cake is frosted in a buttercream chocolate icing rather than a smooth fondant. Expertly made pink frosting roses with green leaves would look sweet and charming placed around the edges of the cake tiers. For a final touch, bands of pink satin ribbon can be used along the base of each layer. 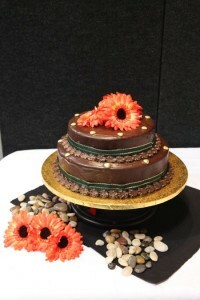 There are some great modern cake designs which can be created for a chocolate wedding cake. Take three narrow layers and stack high before covering with a smooth-as-glass brown fondant. Adorn each tier of the wedding cake with circles in varying sizes done in white, lime green, and tangerine for a mod cake that will steal the show at the reception. Chocolate works great for a country wedding cake. A low cake with two or three wide tiers would look wonderful decorated with fresh strawberries for a summer reception. Another gorgeous idea is to decorate the cake with chocolate cosmos and pink wax flowers. Whichever decorations you choose, your guests are sure to love the sweet ending to your wedding reception! Chocolate cakes for your wedding.